This page details version differences in Camera HALs, APIs, and associated Android Compatibility Test Suite (CTS) tests. It also covers several architectural changes made to harden and secure the camera framework in Android 7.0, the switch to Treble in Android 8.0, and the updates vendors must make to support these changes in their camera implementations. The app-level camera framework on Android 4.4 and earlier devices, exposed through the android.hardware.Camera class. The app-level camera framework on Android 5.0 and later devices, exposed through the android.hardware.camera2 package. The camera module layer implemented by SoC vendors. The app-level public frameworks are built on top of the camera HAL. Version of the camera device HAL released with Android 4.4. Version of the camera device HAL released with Android 5.0. Set of camera Compatibility Test Suite (CTS) tests that run on top of Camera API1. Additional set of camera CTS tests that run on top of Camera API2. Separates the vendor implementation (device-specific, lower-level software written by silicon manufacturers) from the Android OS framework via a new vendor interface. HAL interface definition language introduced with Treble and used to specify the interface between a HAL and its users. Vendor test suite introduced alongside Treble. Android includes the following camera APIs. Camera API1 interfaces for apps. Camera apps built on top of Camera API1 should work as they do on devices running earlier Android release versions. Camera HAL versions. Includes support for Camera HAL1.0. The Camera API2 framework exposes lower-level camera control to the app, including efficient zero-copy burst/streaming flows and per-frame controls of exposure, gain, white balance gains, color conversion, denoising, sharpening, and more. For details, watch the Google I/O video overview. LEGACY: These devices expose capabilities to apps through the Camera API2 interfaces that are approximately the same capabilities as those exposed to apps through the Camera API1 interfaces. The legacy frameworks code conceptually translates Camera API2 calls into Camera API1 calls; legacy devices do not support Camera API2 features such as per-frame controls. LIMITED: These devices support some Camera API2 capabilities (but not all) and must use Camera HAL 3.2 or later. FULL: These devices support all of major capabilities of Camera API2 and must use Camera HAL 3.2 or later and Android 5.0 or later. LEVEL_3: These devices support YUV reprocessing and RAW image capture, along with additional output stream configurations. EXTERNAL: These devices are similar to LIMITED devices with some exceptions; for example, some sensor or lens information may not be reported or have less stable frame rates. This level is used for external cameras such as USB webcams. Individual capabilities are exposed via the android.request.availableCapabilities property in the Camera API2 interfaces. FULL devices require the MANUAL_SENSOR and MANUAL_POST_PROCESSING capabilities, among others. The RAW capability is optional even for FULL devices. LIMITED devices can advertise any subset of these capabilities, including none of them. However, the BACKWARD_COMPATIBLE capability must always be defined. The supported hardware level of the device, as well as the specific Camera API2 capabilities it supports, are available as the following feature flags to allow Google Play filtering of Camera API2 camera apps. Devices running Android 5.0 and higher must pass the Camera API1 CTS, Camera API2 CTS, and CTS Verifier camera tests. Devices that do not feature a Camera HAL3.2 implementation and are not capable of supporting the full Camera API2 interfaces must still pass the Camera API2 CTS tests. However, the device will be running in Camera API2 LEGACY mode (in which the Camera API2 calls are conceptually mapped to Camera API1 calls) so any Camera API2 CTS tests related to features or capabilities beyond Camera API1 will be automatically skipped. On legacy devices, Camera API2 CTS tests that are not skipped use the existing public Camera API1 interfaces and capabilities with no new requirements. Bugs that are exposed (and which cause a Camera API2 CTS failure) are bugs already present in the device’s existing Camera HAL, and thus would be found by existing Camera API1 apps. We do not expect many bugs of this nature (however, any such bugs must be fixed to pass the Camera API2 CTS tests). Devices running Android 8.0 and higher with binderized HAL implementations must pass the Camera VTS tests. To harden media and camera framework security, Android 7.0 moves camera service out of mediaserver. 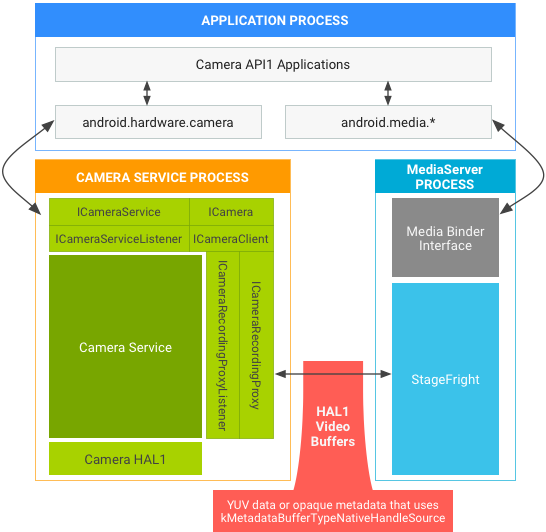 Starting with Android 8.0, each binderized Camera HAL runs in a process separate from camera service. Vendors may need to make changes in the camera HAL depending on the API and HAL versions in use. The following sections detail architectural changes in AP1 and AP2 for HAL1 and HAL3, as well as general requirements. HAL3, where camera service uses BufferQueue to pass buffers between processes, no vendor update is necessary. Figure 1. Android 7.0 camera and media stack in API1 on HAL3. Figure 2. Android 7.0 camera and media stack in API1 on HAL1. HAL1 is not affected by the cameraservice move, and no vendor update is necessary. Figure 3. Android 7.0 camera and media stack in API2 on HAL3. The architectural changes made for hardening media and camera framework security include the following additional device requirements. General. Devices require additional bandwidth due to IPC, which may affect time-sensitive camera use cases such as high-speed video recording. Vendors can measure actual impact by running android.hardware.camera2.cts.PerformanceTest and the Google Camera App for 120/240 FPS high speed video recording. Devices also require a small amount of additional RAM to create the new process. Pass metadata in video buffers (HAL1 only). If HAL1 stores metadata instead of real YUV frame data in video buffers, the HAL must use kMetadataBufferTypeNativeHandleSource as the metadata buffer type and pass VideoNativeHandleMetadata in video buffers. (kMetadataBufferTypeCameraSource is no longer supported on Android 7.0.) With VideoNativeHandleMetadata, camera and media frameworks are able to pass the video buffers between processes by serializing and deserializing the native handles properly. Buffer handle address does not always store the same buffer (HAL3 only). For each capture request, HAL3 gets addresses of buffer handles. HAL cannot use the addresses to identify buffers because the addresses may store another buffer handle after HAL returns the buffer. You must update the HAL to use buffer handles to identify the buffers. For example: HAL receives a buffer handle address A, which stores buffer handle A. After HAL returns buffer handle A, buffer handle address A may store buffer handle B next time the HAL receives it. Update SELinux policies for cameraserver. If device-specific SELinux policies give mediaserver permissions to run the camera, you must update the SELinux policies to give cameraserver proper permissions. We do not encourage replicating the mediaserver's SELinux policies for cameraserver (as mediaserver and cameraserver generally require different resources in the system). Cameraserver should have only the permissions needed to perform camera functionalities and any unnecessary camera-related permissions in mediaserver should be removed. Separation between Camera HAL and cameraserver. Android 8.0 and higher additionally separate the binderized Camera HAL in a process different from cameraserver. IPC goes through HIDL-defined interfaces. For all devices that include a camera and run Android 7.0, verify the implementation by running Android 7.0 CTS. Although Android 7.0 does not include new CTS tests that verify camera service changes, existing CTS tests will fail if you have not made the updates indicated above. For all devices that include a camera and run Android 8.0 and higher, verify the vendor implementation by running VTS. For a list of tests available for evaluating the Android Camera HAL, see the Camera HAL Testing Checklist. See the sections below for more information on these features. This feature enables only one set of buffers to drive two outputs, such as preview and video encoding, which lowers power and memory consumption. To support this feature, device manufacturers need to ensure their camera HAL and gralloc HAL implementations can create gralloc buffers that will be used by multiple different consumers (such as the hardware composer/GPU and the video encoder), instead of just one consumer. The camera service will pass the consumer usage flags to the camera HAL and the gralloc HAL; they need to either allocate the right kinds of buffers, or the camera HAL needs to return an error that this combination of consumers is not supported. See the enableSurfaceSharing developer documentation for additional details. The public camera API defines two operating modes: normal and constrained high-speed recording. They have fairly different semantics; high-speed mode is limited to at most two specific outputs at once, etc. Various OEMs have expressed interest in defining other custom modes for hardware-specific capabilities. Under the hood, the mode is just an integer passed to configure_streams. See: hardware/camera/device/3.2/ICameraDeviceSession#configurestreams. This feature includes a system API call that OEM camera apps can use to enable a custom mode. These modes must start at integer value 0x8000 to avoid conflicting with future modes added to the public API. To support this feature, OEMs merely need to add the new mode to their HAL, triggered by this integer passed to the HAL on configure_streams, and then have their custom camera app use the system API. The method name is android.hardware.camera2.CameraDevice#createCustomCaptureSession. See: frameworks/base/core/java/android/hardware/camera2/CameraDevice.java#805. Note: In the Android 8.1 release, applications must be preinstalled on the system image to access this API. The purpose of this API is to reduce the latency of control changes like zoom by keeping the request queue as empty as possible. onCaptureQueueEmpty requires no HAL work; it was purely a framework-side addition. Applications that want to take advantage of it need to add a listener to that callback and respond appropriately. Generally that's by sending another capture request to the camera device. The Camera HIDL interface is a complete overhaul of the Camera HAL interface that uses stable HIDL-defined APIs. All features and camera capabilities introduced in the most recent legacy versions 3.4 and 2.4 (for the camera module) are also part of the HIDL definitions. Add ANDROID_SENSOR_OPAQUE_RAW_SIZE static metadata as mandatory if RAW_OPAQUE format is supported. Add ANDROID_CONTROL_POST_RAW_SENSITIVITY_BOOST_RANGE static metadata as mandatory if any RAW format is supported. Switch camera3_stream_t data_space field to a more flexible definition, using the version 0 definition of dataspace encoding. OPAQUE and YUV reprocessing API updates. Basic support for depth output buffers. Addition of data_space field to camera3_stream_t. Addition of rotation field to camera3_stream_t. Addition of camera3 stream configuration operation mode to camera3_stream_configuration_t. Deprecates get_metadata_vendor_tag_ops. Use get_vendor_tag_ops in camera_common.h instead. Deprecates register_stream_buffers. All gralloc buffers provided by framework to HAL in process_capture_request may be new at any time. Add partial result support. process_capture_result may be called multiple times with a subset of the available results before the full result is available. Add manual template to camera3_request_template. Applications may use this template to control the capture settings directly. Rework the bidirectional and input stream specifications. Change the input buffer return path. The buffer is returned in process_capture_result instead of process_capture_request. configure_streams passes consumer usage flags to the HAL. flush call to drop all in-flight requests/buffers as fast as possible. Major version change since the ABI is completely different. No change to the required hardware capabilities or operational model from 2.0. Reworked input request and stream queue interfaces: Framework calls into HAL with next request and stream buffers already dequeued. Sync framework support is included, necessary for efficient implementations. Moved triggers into requests, most notifications into results. Consolidated all callbacks into framework into one structure, and all setup methods into a single initialize() call. Made stream configuration into a single call to simplify stream management. Bidirectional streams replace STREAM_FROM_STREAM construct. Limited mode semantics for older/limited hardware devices. 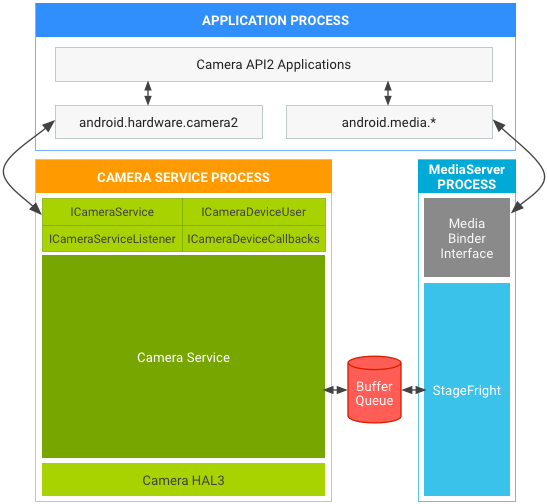 Sufficient for implementing existing android.hardware.Camera API. Allows for ZSL queue in camera service layer. Not tested for any new features such as manual capture control, Bayer RAW capture, reprocessing of RAW data, etc. Converted from C++ CameraHardwareInterface abstraction layer. This section contains module versioning information for the Camera hardware module, based on camera_module_t.common.module_api_version. The two most significant hex digits represent the major version, and the two least significant represent the minor version. Torch mode support. The framework can turn on torch mode for any camera device that has a flash unit, without opening a camera device. The camera device has a higher priority accessing the flash unit than the camera module; opening a camera device will turn off the torch if it had been enabled through the module interface. When there are any resource conflicts, such as open() is called to open a camera device, the camera HAL module must notify the framework through the torch mode status callback that the torch mode has been turned off. External camera (e.g. USB hot-plug camera) support. The API updates specify the camera static info is available only when camera is connected and ready to use for external hot-plug cameras. Calls to get static info will be invalid calls when camera status is not CAMERA_DEVICE_STATUS_PRESENT. The framework counts solely on device status change callbacks to manage the available external camera list. Camera arbitration hints. Adds support for explicitly indicating the number of camera devices that can be simultaneously opened and used. To specify valid combinations of devices, the resource_cost and conflicting_devices fields should always be set in the camera_info structure returned by the get_camera_info call. Module initialization method. Called by the camera service after the HAL module is loaded to allow for one-time initialization of the HAL. It is called before any other module methods are invoked. This camera module version adds open legacy camera HAL device support. The framework can use it to open the camera device as lower device HAL version HAL device if the same device can support multiple device API versions. The standard hardware module open call (common.methods->open) continues to open the camera device with the latest supported version, which is also the version listed in camera_info_t.device_version. This camera module version adds vendor tag support from the module, and deprecates the old vendor_tag_query_ops that were previously only accessible with a device open. This camera module version adds support for asynchronous callbacks to the framework from the camera HAL module, which is used to notify the framework about changes to the camera module state. Modules that provide a valid set_callbacks() method must report at least this version number. Camera modules that report this version number implement the second version of the camera module HAL interface. Camera devices openable through this module may support either version 1.0 or version 2.0 of the camera device HAL interface. The device_version field of camera_info is always valid; the static_camera_characteristics field of camera_info is valid if the device_version field is 2.0 or higher. Camera modules that report these version numbers implement the initial camera module HAL interface. All camera devices openable through this module support only version 1 of the camera device HAL. The device_version and static_camera_characteristics fields of camera_info are not valid. 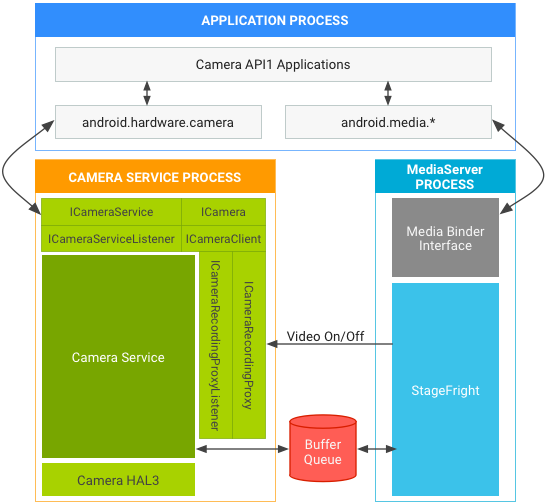 Only the android.hardware.Camera API can be supported by this module and its devices.